Robyn Connelly qualified as a registered general nurse in 2012 from the University of the West of Scotland. After moving to London she worked as a trauma theatre lead nurse at St Thomas’ Hospital and as a sexual health matron in London and Essex before returning to Scotland in 2016 to join nursing agency ScotNursing. 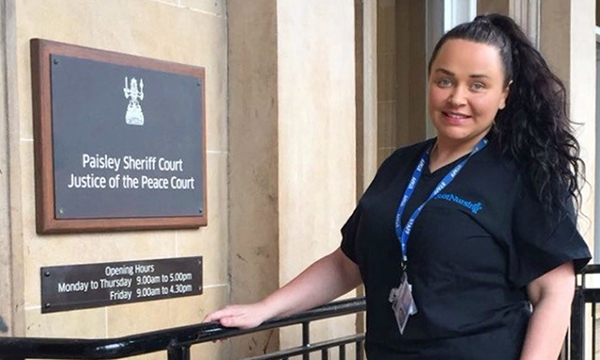 She completed custody nurse training with the agency and has been in her current role as a full-time custody nurse for two years. As a custody nurse covering the west of Scotland I am called to the courts to carry out clinical assessments and examinations of people who have been detained. This involves collecting information so I can identify any health issues and initiate appropriate health interventions. People who have been detained in custody, including those waiting for court decisions on whether they will be granted bail or kept in custody. Many of those I care for have problems with drug and alcohol addiction. The unknown – I never know what to expect from day to day, and each call-out is different. I also enjoy the travelling that comes with covering such a large geographical area. Dealing with vulnerable people who have an addiction. They usually have traumatic stories to tell and are often crying out for help. As soon as I get the call I get my court bag – which contains items such as blood pressure and blood glucose monitoring equipment, dressings, swabs, saline and venepuncture equipment – and head straight to court. I have to move quickly as I have to decide whether a detainee is fit to be interviewed and/or detained, or if I need to refer them to hospital for further clinical assessment or treatment. My communication skills have developed greatly in this role, especially my ability to really listen to what people are saying. This is crucial if I want them to open up to me. I also liaise with a variety of other professionals, including police officers, solicitors, prison officers and other health professionals such as GPs. I was once stopped in the street by a former patient who told me he had sorted his life out and was drug-free thanks to me. Just one simple phone call to his GP set him on the road to recovery and he has now been clean from heroin for over a year. A teacher – I really enjoyed biology at school, so probably a biology teacher. I am a mentor and love teaching students, so possibly a move into education. Life is far too short and can be cruel. Live every day like it’s your last, as none of us are guaranteed a tomorrow. Study and revise harder, and never stop learning.